By the 1830's the residential neighborhood known as the Bond Street Area featured handsome Federal-style mansions and merchant-class homes filled with furniture by Duncan Phyfe and Joseph Meeks. 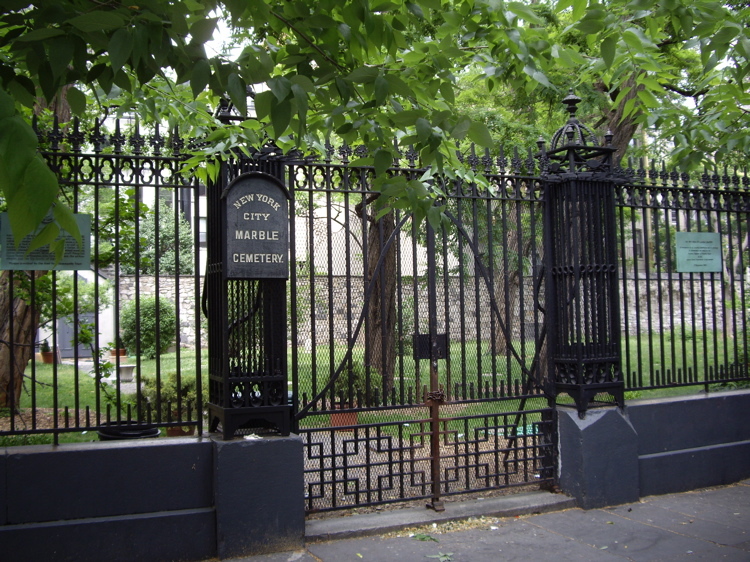 On Second Avenue, hidden behind houses with only a narrow passage marked by a wrought-iron gate, the New York Marble Cemetery was established in 1830. A severely conservative space, it was surrounded by a rubble stone wall in which three tiers of marble plaques documented the names of the interred. No monuments or headstones were allowed, leaving the burial ground to appear as a grassy lawn. A year later, around the corner on East 2nd Street between First and Second Avenues a second cemetery was begun on property possessed by Samuel Cowdrey (who already owned a vault in the Second Avenue graveyard). Organized by a group of well-to-do businessmen including Thomas Addis Emmet, Garret Storm, Henry Booraem, Samel Whittemore and Evert Bancker, it had the confusingly similar name of The New York City Marble Cemetery. It would be the second non-sectarian cemetery in the city. By 1835, additional lots of land had been added to accommodate 25 vaults. A high brick wall ran around three sides while the 2nd Street side was guarded by an elegant cast iron fence and gate. Long walks separated the lines of vaults and the New York City Marble Cemetery became a fashionable burial site for New York’s wealthy families. As the century progressed beautiful marble monuments were erected to mark the graves of notable New Yorkers – New York City Mayor and New York State Governor Stephen Allen, James Lenox, Revolutionary War hero Marinus Willet, Samuel Kip (remembered in the name of Kip’s Bay) and all of his family, six Roosevelts, and Mayor Isaac Varian. Other notable persons buried here were John Lloyd Stephens, the archaeologist who pioneered exploration of Mayan Mexico, John Ericsson who invented the Civil War ironclad Monitor (his body was later removed to Sweden), Stephen Decatur, James Watson Webb, Jonathan Ogden and Moses Taylor. One of the first persons buried in the cemetery was former President James Monroe who died in New York of tuberculosis and heart failure on July 4, 1831; the same year the burial ground was opened. Thirty-three pall bearers accompanied his coffin, followed by an impressive stream of veterans, dignitaries, and family. Thousands crammed the streets to view the procession up Broadway to Monroe’s son-in-law’s crypt. Church bells tolled throughout the city and cannons from the Battery were fired. The State of Virginia, 27 years later, petitioned for reburial of the president in his home state. On July 2, 1858, the body was exhumed and the following day loaded on the ship Jamestown for its journey home. In the decades after the Civil War the Bond Street area lost favor as prosperous families moved further uptown. Beginning in the 1870's some relatives removed the remains of their families to cemeteries in more fashionable districts. At the time there was a comfortable $17,000 in the permanent fund, greatly assisted by a bequest of $5,000 from William C. Treadwell’s estate. 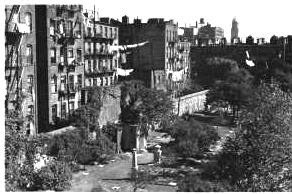 By 1897 the cemetery, while carefully maintained, was little used and was being hemmed in by tenement buildings. The elegant brick homes with marble trim were mostly a memory. That year, when the body of millionaire Reuben B. Withers was returned from Paris for burial here, the ceremony -- now no longer routine -- caused a stir. The New York Times commented that a “burial, a rare occurrence in these days for the place, occurred yesterday in the quaint old New York City Marble Cemetery in Second Street, Between First and Second Avenues. “Women and children thronged the windows and fire escapes of the tenements which look down upon the cemetery, and street urchins crowded about the iron fence to see the burial,” the newspaper said. The quiet and picturesque little cemetery, which was given landmark status in 1969, was jolted into public awareness in 2010 when a maintenance worker discovered a garbage bag containing what the New York City Police Department Bomb Squad identified as C-4 military-grad explosive bricks. The plastic explosives, more powerful than TNT, were removed without incident. This picturesque page from New York's genteel past is still lovingly maintained yet widely unknown. As a "Graveyard Rabbit", I can't believe I missed this post, even if it was years ago. Next trip, I will visit and say hello to Preserved Fish.